Great product :"I have a staffie and a rottie. Toys need to be sturdy and this is much tougher than I expected for the price. I am also a dog boarder so interactive toys are essential in our house. My dogs are advanc"
Dogs are very intelligent and inquisitive animals. They don't just want to just be physically occupied in play and training, they also want to be challenged mentally. 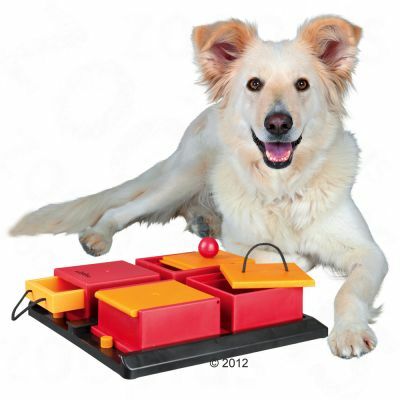 The Trixie Dog Activity Game was developed both for dog and owner. 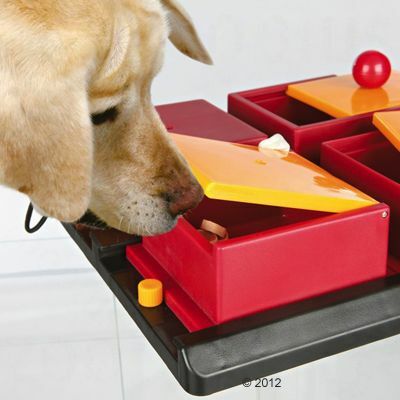 The Dog Activity Poker Box is an ideal game for occupying your advanced dog. The "Poker Box" is a strategy game with four compartments that all open in a different way. Your pet has to figure out how to open each little box to get the treats hidden inside. The toy is dishwasher safe and should be cleaned regularly. Ideal for mentally training your dog! Find tips and tricks in the attached handbook for how to best train your dog and form a real bond. As with any other product your pet should be supervised with this toy. Please check the product regularly for any damage, and replace the toy if it becomes defective or if a piece of the toy goes missing to avoid any harm coming to your pet. I have a staffie and a rottie. Toys need to be sturdy and this is much tougher than I expected for the price. I am also a dog boarder so interactive toys are essential in our house. My dogs are advanced trained but even so they are enjoying using this product. I am sure my regular visitors will too. It is easy to clean and the only thing to be careful of are the two tiny pegs that keep the boxes in the tray. I have been playing hide and seek with the individual boxes too. Disappointed as my puppy was very quick to work this out and it is no challenge for her. Good build quality, chew resistant. I'm just disappointed that my dog figured all four boxes out within 3 mins. For the price I was hoping for longer entertainment. My JRT worked it out in seconds but it still makes good fun from time to time. A nice way to interact with your dog and a good party trick, especially if you have children! My 5 month old springer worked out her first box in 30 seconds and all four in 4 minutes and she loved every second. She was very keen to play again. Great toy. The toy seems to be nicely made and the price is reasonable, but TBH the poodles just found it too easy to be a challenge at all after they'd solved it the first few times. Probably a good choice if your dog is not the sharpest knife in the drawer! Bought this for my 10 week old cocker spaniel prior to full innoculations so not yet allowed out and about. We were all suffering from cabin fever being cooped up with an extremely active pup who needed challenges. 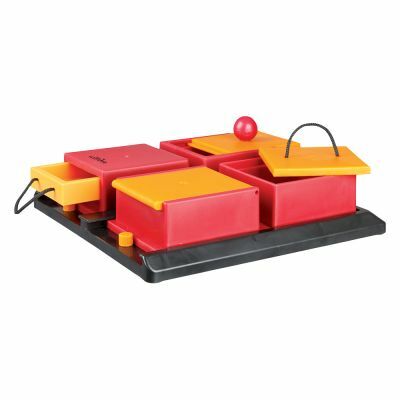 He swooped on this activity centre, admittedly sussing it out within the 1st few times of using it, but now has all his meals out of his 'boxed set', and just loves it. Great entertainment for anyone visiting too! Very sturdy and robust, looks as good as new after 6 weeks of 3 meals a day. Another great Trixie product. Fun but too easy for my pup! My goldendoodle puppy, aged 8 months, cracked this in 10 minutes. Fortunately, she still loves to play with it, probably because there's treats inside! I wanted a challenging toy, but this wasn't it for my girl. Back to the drawing board. I bought this toy for my 7 month old puppy after she needed stitches in her paw and was essentially on house arrest! It's her first 'intelligent' dog toy and she loves it. It's only taken her 4 days to figure the whole thing out, but she still comes to comes to us and then runs to the toy to tell us she wants more treats putting in the game! A great buy, only suggestion would be longer pull strings - we added string onto them so our dog could grab them. Today I got this toy and my 2 year-old Newfoundland just loves it.This is the first intelligent toy that I bought for her and at first I thought it would be too difficult to solve how it works, but she did that quite quickly and realized how to get a treat. She can not stop to enjoy it. We are very happy with our purchase.Great value for money. I have 3 Flat Coated Retrievers - the two youngest have been clicker trained. The 4 yr old opened all 4 boxes in 90 seconds using teeth and paws straightaway. His 6 year old sister also sussed it all out pretty quickly, but their 1o year old mother really struggled and needed lots of praise, help and encouragement. I would venture to suggest that bright active dogs who have had much interaction and training will find the challenge easier than other dogs because they have confidence in 'playing' with their owners; this is a great toy if you have patience and really enjoy interacting with your dog. I put it on the floor with treats in just to have a sniff at it and see what it was, He flipped the lid up right away, then worked at the other three, took him about 10 min to figure them all out, but he loved doing it, his tail was wagging the whole time, Will definatly buy more mental exercise toys! Good but a bit easy! My not-quite-4 month old border collie cracked it in 20 mins (5 mins each section, doing just 1 section at a time to begin with). However, she still loves it and will ask to play it most evenings. When I get it out, she jumps around with excitement and enthusiasm! One problem is she that has learned to pull the pegs (that hold the game in place) out, and as they are a size that she could choke on, it's another game all over again whilst I try to get them out of her mouth. It would be much better if the pegs screwed into place. In the illustration the drawer and the lids look wooden - but they aren't, they're plastic which is disappointing as they don't cope well with enthusiastic chewing. Got this toy for our dogs have already tried it out on two of them, out Papillon has figured out all four already but then when he plays it again he doesn't remember and so the game begins again. They love the toy and it really gets their brains working. Short sessions are best so they don't get frustrated or bored with the toy. Highly recommend it for nosey dogs. 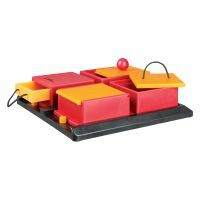 I bought this for my 4yr old border collie,he has never had any other toys like this and i thought it would keep him busy for at least a few days,he worked it out within an hour.i have tried rubbing the treat on one section and placeing it in another to confuse him but he still opened the correct one straight away,maybe more suitable for a novice. My neighbour and I swap pet toys every now and then. She has dogs, I have cats. Especially this game was great for my 9-year old tabby. He plays with surprising enthusiasm and usually for ages. And my neighbour's two dogs love it just as much. Absolutely recommended! I've been buying from zooplus for years and can only say that I'm a very satisfied customer.